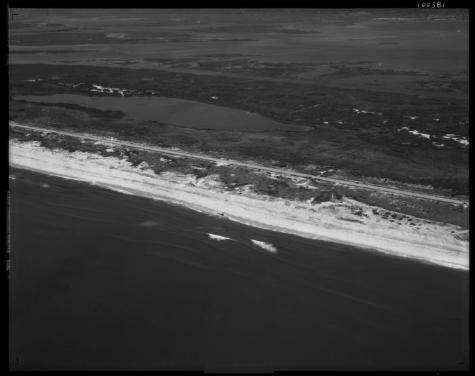 View of a beach on an unidentified barrier island on Long Island, possibly Jones Beach or Fire Island. There is little development on this part of the island. Waves can be seen rolling in from the open ocean, forming berms on the beach. There is a large pond on the island, and a lagoon with small islands can be seen in the background. Source: New York State Archives, Aerial photographic prints and negatives of New York State sites, 1941-1957, B1598-99. Box 10, no. 86.